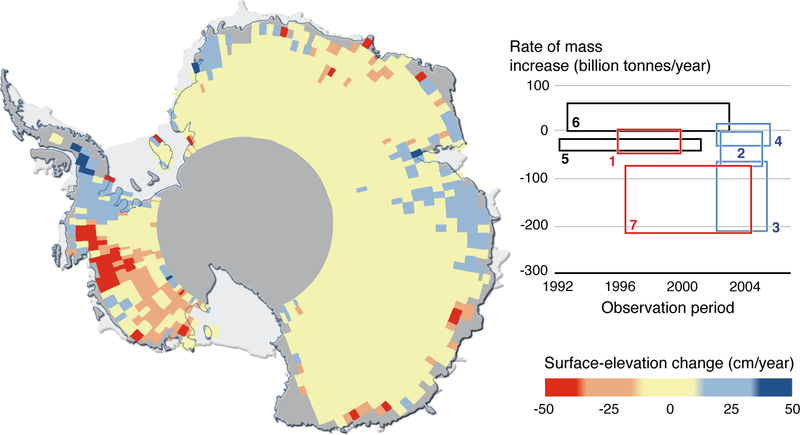 The figure shows rates at which the ice-sheet mass was estimated to be changing based on radar-altimeter data (black), mass-budget calculations (red), and satellite gravity measurements (blue). Rectangles depict the time periods of observations (horizontal) and the upper and lower estimates of mass balance (vertical). 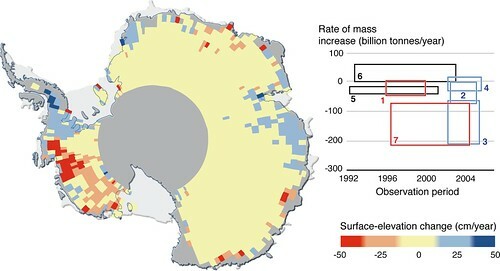 Measurements by satellite techniques based on gravity indicate mass loss at a rate of 138 ± 73 billion tonnes per year during 2002–2005, mostly from the West Antarctica Ice Sheet. That is equivalent to a rise in global sea level of 0.4 ± 0.2 mm per year, or 10–30% of the global rate measured since the 1950s, and is in good agreement with recent massbudget estimates. However, two interpretations of satellite radar altimetry pointed to a much smaller loss of about 31 billion tonnes of ice per year or a net gain of about 27 billion tonnes per year. The difference between these estimates from totally independent techniques reflects the uncertainties in these difficult measurements; nevertheless, on balance, they indicate a recent shift to a net loss of Antarctic ice and suggest that losses may be accelerating. Similar conclusions result from studies of Antarctic Peninsula glaciers, indicating that they are melting much faster than previously predicted and are probably already contributing significantly to sea-level rise.